American College of Surgeons National Surgical Quality Improvement Program. Surgical quality improvement. http://site.acsnsqip.org. Accessed January 10, 2013. Centers for Disease Control and Prevention. July 2013 CDC/NHSN protocol clarifications. http://www.cdc.gov/nhsn/pdfs/pscmanual/17pscnosinfdef_current.pdf. Accessed August 14, 2013. Importance Neoadjuvant chemotherapy (NC) is increasingly being used in patients with breast cancer, and evidence-based reports related to its independent effects on morbidity after mastectomy with immediate breast reconstruction are limited. Objective To determine the effect of NC on 30-day postoperative morbidity in women undergoing mastectomy with or without immediate breast reconstruction. 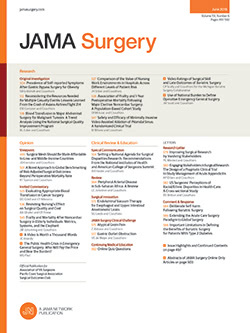 Design, Setting, and Participants All women undergoing mastectomy with or without immediate breast reconstruction from January 1, 2005, through December 31, 2011, at university and private hospitals internationally were analyzed using the American College of Surgeons National Surgical Quality Improvement Program 2005-2011 databases. Patients who received NC were compared with those without a history of NC to estimate the relative odds of 30-day postoperative overall, systemic, and surgical site morbidity using model-wise multivariable logistic regression. Main Outcomes and Measures Thirty-day postoperative morbidity (overall, systemic, and surgical site). Results Of 85 851 women, 66 593 (77.6%) underwent mastectomy without breast reconstruction, with 2876 (4.3%) receiving NC; 7893 patients were excluded because of missing exposure data. The immediate breast reconstruction population included 19 258 patients (22.4%), with 820 (4.3%) receiving NC. After univariable analysis, NC was associated with a 20% lower odds of overall morbidity in the group undergoing mastectomy without breast reconstruction (odds ratio [OR], 0.80; 95% CI, 0.71-0.91) but had no significant effect in the immediate breast reconstruction group (OR, 0.98; 95% CI, 0.79-1.23). After adjustment for confounding, NC was independently associated with lower overall morbidity in the group undergoing mastectomy without breast reconstruction (OR, 0.61; 95% CI, 0.51-0.73) and the immediate tissue expander reconstruction subgroup (OR, 0.49; 95% CI, 0.30-0.84). Neoadjuvant chemotherapy was associated with decreased odds of systemic morbidity in 4 different populations: complete sample (OR, 0.59; 95% CI, 0.49-0.71), mastectomy without breast reconstruction (OR, 0.59; 95% CI, 0.48-0.72), any immediate breast reconstruction (OR, 0.57; 95% CI, 0.37-0.88), and the tissue expander subgroup (OR, 0.41; 95% CI, 0.23-0.72). Conclusions and Relevance Our study supports the safety of NC in women undergoing mastectomy with or without immediate breast reconstruction. Neoadjuvant chemotherapy is associated with lower overall morbidity in the patients undergoing mastectomy without breast reconstruction and in those undergoing tissue expander breast reconstruction. In addition, the odds of systemic morbidity were decreased in patients undergoing mastectomy with and without immediate breast reconstruction. The mechanisms behind the protective association of NC remain unknown and warrant further investigation. Indications for neoadjuvant chemotherapy (NC) in the treatment of early-stage and locally advanced breast cancer are increasing, irrespective of tumor size.1 Neoadjuvant chemotherapy can downstage the primary tumor and axillary metastases, offering a less morbid surgical approach and treatment.2 Neoadjuvant chemotherapy also allows for real-time monitoring of the tumor’s response to therapy in vivo, with the ability for real-time adjustment of treatment.3 Overall survival and disease-free survival are equivalent between NC and adjuvant chemotherapy; therefore, any patient expecting to undergo systemic cytotoxic treatment can be offered NC and benefit from such advantages.2-5 However, the effects of NC on postoperative morbidity are not well established. On the basis of anecdotal evidence, most surgeons believe that NC greatly increases postoperative morbidity, in particular surgical site complications. Therefore, we sought to investigate the morbidity profiles and postoperative outcomes of patients receiving NC after mastectomy with or without immediate breast reconstruction. Several single-institution series6-9 have examined the postoperative effects of NC on mastectomy and immediate breast reconstruction, all finding no increase in morbidity. However, these studies were limited by relatively small sample sizes at single academic institutions and did not fully adjust for major confounding. Neoadjuvant chemotherapy reduces perioperative morbidity in senior patients (those 70 years or older) with advanced-stage ovarian cancer10 and decreases major complications in patients with metastatic colorectal cancer.11 In addition, NC does not increase morbidity and mortality in patients with gastric cancer.12 The effect of NC on postoperative morbidity is being actively investigated among several disciplines. The purpose of this study is to determine the effect of NC on 30-day postoperative morbidity in women undergoing mastectomy with or without immediate breast reconstruction using the American College of Surgeons National Surgical Quality Improvement Program (ACS-NSQIP) database.13 Specifically, our primary aim was to determine whether exposure to NC before mastectomy with immediate breast reconstruction increases postoperative morbidity. In addition, we explored the effect of various comorbidities on the association between NC and postoperative outcomes. By using an internationally validated, multi-institutional, prospective, risk-adjusted, outcomes-based registry, we were able to examine a large, diverse population of women. All women undergoing mastectomy with and without breast reconstruction from January 1, 2005, through December 31, 2011, were identified using the following Current Procedural Terminology codes for breast reconstruction: 19160, 19301, 19162, 19302, 19180, 19303, 19182, 19304, 19200, 19305, 19220, 19306, 19307, 19240 for partial or total mastectomy and 19340, 19342, 19357, 19361, 19364, 19366, 19367, 19368, and 19369 (eTable 1 in the Supplement). Patients with 2 simultaneous Current Procedural Terminology codes, 1 signaling mastectomy and 1 signaling breast reconstruction, define the immediate breast reconstruction population. The ACS-NSQIP database collects morbidity events that occur within 30 postoperative days. Overall postoperative morbidity was predefined as follows: superficial and deep incisional surgical site infection (SSI), organ space SSI, wound dehiscence, pneumonia, unplanned intubation, pulmonary embolism, more than 48 hours of ventilatory assistance, progressive renal insufficiency, acute renal failure, urinary tract infection, stroke or cerebrovascular accident, coma of more than 24 hours, cardiac arrest, myocardial infarction, bleeding requiring transfusion, prosthesis or flap failure, deep vein thrombosis requiring treatment, sepsis, septic shock, and return to the operating room within 30 days. Surgical site morbidity included superficial and deep incisional SSI, organ space SSI, wound dehiscence, and prosthesis or flap failure. Systemic morbidity includes variables from the overall postoperative morbidity definition, excluding surgical site morbidity variables. Data management and analyses were performed with STATA/SE statistical software, version 12 (Stata Corp). Odds ratios (ORs) that reflect 30-day morbidity were estimated using a multivariable logistic regression model that compared patients receiving NC with those who did not receive NC for each surgical procedure type. We used a model-wise approach and adjusted for clinically and statistically relevant confounders.15 Statistically significant predictors in the univariable analysis (P < .05) were further included in multivariable models. Adjustment variables included age, body mass index, smoking status, work relative value unit, operation year, inpatient status, American Society of Anesthesiologists classification, previous wound infection, wound classification, previous cardiovascular morbidity, previous respiratory morbidity, previous renal morbidity, previous hemato-oncologic morbidity, diabetic status, corticosteroid use for chronic condition, and operation time. Inpatient status and corticosteroid use were deemed clinically relevant and added to the model. Perioperative transfusions, type of anesthetic method, and alcohol consumption of more than 2 drinks per day in 2 weeks before admission were omitted because of missing data in more than 10% of patients. Continuous variables are presented as mean (SD), whereas categorical variables are presented as the number (percentage) of patients. P values for continuous variables correspond to a Kruskal-Wallis rank sum test of the null, assuming the location parameters of the distribution of the variable are the same in each exposure group. P values for categorical variables correspond to a Fisher exact test for testing the null of independence of rows and columns in a contingency table with fixed marginals (Table 1). We identified 85 851 women who underwent mastectomy with or without immediate breast reconstruction, of whom 77 958 had NC data. Demographic, preoperative, and operative characteristics are given in Table 1. The mean (SD) age of all patients was 58.5 (13.3) years. Patients receiving NC were more likely to be younger, smokers, inpatients, anemic, and taking corticosteroids for a chronic condition. In addition, they were more likely to have a higher body mass index (calculated as weight in kilograms divided by height in meters squared), open wounds, central nervous system tumors, bleeding disorders, weight loss of more than 10% in the previous 6 months, disseminated cancer, radiotherapy in the previous 30 days, and abnormal laboratory values. They were also more likely to undergo higher work relative value unit procedures. Moreover, they were less likely to have undergone an operation within the previous 30 days; to have a history of angina, peripheral vascular disease, severe chronic obstructive pulmonary disease, transient ischemic attacks, cardiovascular accident with neurologic deficit, or composite cardiovascular, respiratory, and neurologic morbidities; to have undergone a previous percutaneous coronary intervention or previous cardiac surgery; to have hypertension that required medication; to currently be receiving dialysis; and to be alcohol drinkers. Finally, patients receiving NC had longer operation times (eTable 2 in the Supplement provides the complete demographic data). The population that underwent mastectomy without breast reconstruction included 66 593 patients (77.6%), with 2876 (4.3%) receiving NC. The population that underwent mastectomy with immediate breast reconstruction included 19 258 patients (22.4%), with 820 (4.3%) receiving NC (eTable 3 in the Supplement). Of 66 593 patients who underwent mastectomy without breast reconstruction, 7162 (10.8%) experienced morbidity, and of 19 258 patients who underwent mastectomy with immediate breast reconstruction, 2272 (11.8%) experienced morbidity (eTable 3 in the Supplement). Stratified by NC status, of 2876 patients who underwent mastectomy without breast reconstruction who received NC, 267 (9.3%) experienced morbidity, and of 58 200 patients who underwent mastectomy without breast reconstruction who did not receive NC, 6572 (11.3%) experienced morbidity. Of 820 patients in the immediate breast reconstruction group who received NC, 94 (11.5%) experienced morbidity. Of these 820 patients, 573 had their breasts reconstructed with tissue expanders (TEs), 90 with implants, and 157 with flaps. Stratified by breast reconstruction technique, 48 patients with TEs (8.4%), 12 patients with implants (13.3%), and 34 patients with flaps (21.7%) experienced morbidity. As a whole, of 16 062 patients in the immediate breast reconstruction group who did not receive NC, 1867 (11.6%) experienced morbidity. From the 16 062 patients, 10 996 received TEs, 2245 received implants, and 2821 received flaps. By reconstruction technique, 1121 patients with TEs (10.2%), 255 patients with implants (11.4%), and 491 patients with flaps (17.4%) experienced morbidity within 30 days (Table 2). A flowchart of the morbidity rates in patients undergoing mastectomy with or without breast reconstruction by NC status is shown in the Figure. Univariable analysis indicated that NC was significantly associated with a lower overall morbidity in the group undergoing mastectomy without breast reconstruction (unadjusted OR, 0.80; 95% CI, 0.71-0.91) and had no significant effect on the immediate breast reconstruction group (unadjusted OR, 0.98; 95% CI, 0.79-1.23). This association persisted after extensive adjustment, revealing that NC was significantly associated with lower overall morbidity in the group undergoing mastectomy without breast reconstruction (adjusted OR, 0.61; 95% CI, 0.51-0.73). Neoadjuvant chemotherapy appears to have a protective effect on immediate reconstruction; however, this finding was not statistically significant (adjusted OR, 0.69; 95% CI, 0.47-1.04). The entire population receiving NC had decreased odds of morbidity compared with the patients not receiving NC after univariable (unadjusted OR, 0.84; 95% CI, 0.76-0.94) and multivariable (adjusted OR, 0.64; 95% CI, 0.54-0.75) analyses (Table 2). Subgroup analyses revealed that NC was significantly associated with decreased odds of overall morbidity in the TE subgroup (adjusted OR, 0.49; 95% CI, 0.30-0.84), whereas the implant subgroup (adjusted OR, 0.96; 95% CI, 0.33-2.78) and the flap subgroup (adjusted OR, 1.15; 95% CI, 0.52-2.54) had no significant effect (Table 2). Overall morbidity was divided into surgical site vs systemic morbidity. Patients receiving NC had the same odds of local surgical site morbidity as non-NC patients (adjusted OR, 0.84; 95% CI, 0.65-1.09) (Table 3). The same effect was observed when all patients were grouped into patients undergoing mastectomy without breast reconstruction (adjusted OR, 0.78; 95% CI, 0.58-1.05) and patients undergoing mastectomy with breast reconstruction cohorts (adjusted OR, 0.94; 95% CI, 0.53-1.64). However, NC was associated with decreased odds of systemic morbidity (adjusted OR, 0.59; 95% CI, 0.49-0.71) (Table 4). Mastectomy without breast reconstruction (adjusted OR, 0.59; 95% CI, 0.48-0.72), mastectomy with breast reconstruction (adjusted OR, 0.57; 95% CI, 0.37-0.88), and TEs (adjusted OR, 0.41; 95% CI, 0.23-0.72) were all associated with decreased odds of systemic morbidity. The predictors of overall 30-day postoperative morbidity in 59 623 patients undergoing mastectomy without breast reconstruction and 16 742 patients undergoing mastectomy with breast reconstruction are outlined in eTable 4 and eTable 5 in the Supplement. Our study indicates that NC significantly reduces 30-day postoperative morbidity in women undergoing mastectomy without breast reconstruction and in women undergoing mastectomy with TE breast reconstruction. In addition, NC is associated with decreased systemic morbidity in patients undergoing immediate breast reconstruction, when grouping all immediate TE, implant, and flap patients together. On subgroup analysis, NC does not affect the 30-day postoperative morbidity in the subgroups of patients receiving immediate implants or immediate flaps; however, the sample size of these individual subgroups may be too small to infer equivalence. Overall, our study supports the safety profile of NC in women undergoing mastectomy without immediate breast reconstruction. After subgroup analysis, we found NC to be associated with decreased morbidity in the immediate TE breast reconstruction subgroup. After morbidity was stratified into local vs systemic complications, NC was associated with significantly reduced morbidity in the systemic immediate breast reconstruction cohort. These findings indicate that NC may affect systemic morbidities more so than local surgical site complications among patients undergoing breast reconstruction. Future objectives should evaluate whether chemotherapy is a significant predictor of morbidity in the setting of more complete transfusion, alcohol, and previous operative data. Nevertheless, after adjustment for critical confounders, NC was associated with lower morbidity in the immediate TE breast reconstruction subgroup, especially for systemic complications. Mittendorf et al24 present the most recent and largest series to date of segmental mastectomy. When comparing the presenting clinical stage of tumor, no significant difference was found in 5- and 10-year locoregional recurrence when comparing patients who received preoperative or postoperative chemotherapy. High rates of locoregional control can be achieved in patients receiving NC before surgery, indicating its efficacy in patients undergoing mastectomy. The effect of NC on postoperative morbidity has been sparsely studied. Using the ACS-NSQIP, Decker et al25 analyzed the effect of NC on postoperative wound complications in 44 533 patients undergoing breast surgery (2006 receiving NC), finding no significant difference between patients receiving and not receiving NC (3.4% vs 3.1%). Without separating the groups, it is not possible to tell whether there was a morbidity difference among mastectomy, breast-conserving surgery, and breast reconstruction. Schaverien and Munnoch,3 Selber et al,26 and Mehrara et al27 report on NC outcomes of immediate free autologous breast reconstruction. Mehrara et al27 analyzed 952 patients, of whom 70 had received NC, and found NC to be an independent predictor of minor complications. Selber et al26 report on 500 patients with free transverse rectus abdominis myocutaneous flaps, 30 who received NC, finding that NC did not increase complications. Schaverien and Munnoch3 studied 87 patients receiving NC, finding that NC followed by immediate free autologous breast reconstruction had similar complication rates in 30 patients compared with patients not receiving NC. Azzawi et al6 describe 171 patients undergoing 198 immediate breast reconstructions, including 64 free flaps, 74 pedicled flaps, and 60 implant-only procedures. Fifty-three patients (31.0%) received NC. Patients receiving NC vs the control patients had complication rates of 1.7% vs 2.1% for failed reconstruction, 9% vs 9% for subsequent operation for major complications, and 10% vs 6% for minor complications. In this study, NC does not appear to increase the risk of morbidity after immediate breast reconstruction. Finally, Oh et al28 review the current literature regarding NC and breast reconstruction. They conclude that NC and adjuvant chemotherapy do not appear to be associated with an increased risk of complications in breast reconstruction. Our study supports the current literature, finding no increase in 30-day postoperative overall morbidity rates in women receiving NC who undergo immediate implant or flap-based reconstruction. However, our finding that NC was associated with lower morbidity in the settings of mastectomy without breast reconstruction and TE reconstruction is novel. Key strengths of our study include the large, prospective, random sample of surgical patients with more than 250 variables. We adjusted extensively for confounding after univariable analysis. The completeness of the data set, the diversity of the patients’ settings and demographics, and the broad adjustment used in our model suggest the effect of NC is independent and may not be due to other known risk factors. There are several limitations in our study. First, NC could have been used more often to treat larger and more aggressive tumors (eg, inflammatory breast cancer). This might affect long-term survival and recurrence rates but less likely postoperative morbidity. Second, the ACS-NSQIP database does not include other variables relevant to outcomes and morbidity, such as the stage of the cancer, tumor characteristics, or a delay in adjuvant chemotherapy initiation. Third, it is possible that some TE and implant surgical site infections will present after the 30-day window captured by the ACS-NSQIP. In fact, the Centers for Disease Control and Prevention recommends that implants have a 90-day surveillance period for ascribing deep incisional or organ space SSI (but superficial incisional SSIs are followed up for only 30 days for all procedure types).29 Fourth, our cohort of patients receiving NC could be incomplete. The ACS-NSQIP database reports on chemotherapy received 30 days before operation, which may affect exposure group definitions. Thus, some patients receiving NC could have a greater than 30-day interval between the end of chemotherapy and operation. The optimal time between chemotherapy and operation has yet to be defined or standardized. However, a randomized clinical trial30 found the interval between chemotherapy and surgery to be 14 to 28 days. In addition, a retrospective study31 conveyed a median interval of 26 days. These data support the categorization of our NC cohort to be appropriate. The mechanisms for NC protection from postoperative morbidity, especially systemic morbidity, within the setting of mastectomy and breast reconstruction are unknown. We hypothesized that the use of NC decreases the tumor size, reducing operation time. Because operation time is a known independent risk factor for morbidity, reduced operation time could lead to decreased overall morbidity. Therefore, the decrease in risk may be mediated by the reduced operation time. For this reason, our multivariable models adjust for operation time to assess the independent effect of NC. Moreover, we observed that women undergoing NC had significantly prolonged operation times (mean, 31.2 minutes) when undergoing mastectomy without breast reconstruction. In immediate reconstruction, operation times were the same regardless of NC status. We believe an explanation for longer operation times could be surgeon bias to a known treatment, exposing chemotherapy patients to a slower and more thorough dissection. Consequently, the plausible protective association remains unexplained, and the mechanisms behind it, along with the surgical and oncologic benefits of NC, warrant further investigation. Understanding the effect of NC on reconstruction options is important for shared decision making between the patient and physician. Therefore, we highlight that NC might be particularly beneficial in the TE population and is not associated with harm. On the basis of our results and the current literature, patients receiving NC and electing for reconstruction could most benefit from a TE reconstruction. However, one must also consider the morbidity associated with the expander-implant exchange, which is performed later, giving the patient and the surgeon time to optimize any potentially modifiable risk factors, such as anemia. Expander-implant exchange complication rates are low, reported at 2.7% in a 1055-patient study.32 Most postoperative morbidity occurs after the TE insertion (8.5%) rather than the exchange. In addition, Singh et al33 found lower unplanned subsequent operation rates among women undergoing TE reconstruction vs single-stage reconstructions. Therefore, overall morbidity risk could be optimized using the TE reconstruction method, with comparable reconstructive outcomes. In the setting of any reconstruction type, NC seems to be associated with decreasing or keeping the risk of postoperative morbidity the same, therefore yielding safe and successful results. In this study, NC was associated with reduced odds of overall 30-day postoperative morbidity in patients undergoing mastectomy with or without breast reconstruction. Neoadjuvant chemotherapy decreased the odds of systemic morbidity for patients undergoing mastectomy with or without breast reconstruction but did not affect the odds of local surgical site complications. Our data support the safety profile of NC in women undergoing mastectomy with or without breast reconstruction. To our knowledge, this study is the largest analysis of postoperative morbidity among these populations. Because of decreased overall and systemic morbidity in immediate breast reconstruction, these patients may benefit from TE breast reconstruction. Neoadjuvant chemotherapy is compatible with mastectomy with or without breast reconstruction and is associated with improved morbidity profiles of both. Accepted for Publication: January 21, 2014. Corresponding Author: Gedge D. Rosson, MD, Department of Plastic and Reconstructive Surgery, Johns Hopkins University School of Medicine, 601 N Caroline St, Ste 8161, Baltimore, MD 21287 (gedge@jhmi.edu). Published Online: August 13, 2014. doi:10.1001/jamasurg.2014.1076. Author Contributions: Dr Rosson had full access to all the data in the study and takes responsibility for the integrity of the data and the accuracy of the data analysis. Study concept and design: Abt, Flores, Baltodano, Sarhane, Cooney, Manahan, Stearns, Makary, Rosson. Acquisition, analysis, or interpretation of data: Abt, Flores, Baltodano, Sarhane, Abreu, Stearns, Makary, Rosson. Drafting of the manuscript: Abt, Flores, Baltodano, Rosson. Statistical analysis: Abt, Flores, Baltodano, Sarhane, Abreu. Administrative, technical, or material support: Abt, Stearns, Makary. Study supervision: Abt, Cooney, Manahan, Makary, Rosson. Conflict of Interest Disclosures: Dr Rosson reported having intellectual property licensed to Aegeria Soft Tissue LLC. No other disclosures were reported. Funding/Support: This study was supported in part by Center of Excellence Award AVON 01-2008-012 from the Avon Foundation for Women, which supports laboratory space for the investigators in the Johns Hopkins Hospital Avon Foundation Breast Center and regulatory and study coordinator support. Disclaimer: The ACS-NSQIP and the hospitals participating in the ACS-NSQIP are the source of the data used herein; they have not verified and are not responsible for the statistical validity of the data analysis or the conclusions derived by the authors. Previous Presentations: Presented as a podium presentation at the 11th Annual AMA Research Symposium; November 15, 2013; National Harbor, Maryland; and as a poster presentation at the 59th Annual Plastic Surgery Research Council; March 7, 2014; New York, New York. Additional Information: Deidentified patient information is freely available to all institutional members who comply with the ACS-NSQIP Data Use Agreement. The Data Use Agreement implements the protections afforded by the Health Insurance Portability and Accountability Act of 1996 and the ACS-NSQIP Hospital Participation Agreement. This study conforms to the Declaration of Helsinki.